The weather outside may be frightful, but that doesn’t mean that you can completely neglect your gardening area. Since most plants are at rest and snow tends to cover our area leaving a palette of white and grey, your outdoor area may be begging for some color. Even though you may get some cold feet (pun intended), winter is the perfect time to add some pizzazz to your landscape. To help breathe a little life into your garden area, we’ve compiled this list of landscaping projects to think about this winter (even if it may be too late to implement this year). Several trees and shrubs (like Crabapples and Holly) keep their berries during the winter months, which can add some reds to your winter palette. In addition to being beautiful, they can help feed birds in your area. Evergreens are a great addition to a winter landscape. Not only does it add color (they’re available in greens, yellows and blues), they make design sense. They’re a perfect focal point year-round. Especially if you’re starting from scratch, one or two evergreens are a wonderful place to start. Even though most trees drop their leaves in fall, some (like the deciduous) wait to lose them until the wintertime, leaving their branches and trunks in focus. Bark can add some visual interest, and many are smaller, which means they’re easier to find spots for in the winter landscape. We recommend dogwoods and birch trees for texture and color. Although gardeners love to focus on the landscape, winter is a great time to assess your landscape and where you might be missing some focal points. A solution to enhancing your winter landscape may not be a plant at all; perhaps it’s time to consider a trellis, a bench, a sculpture, or a wheelbarrow. 5. Perennials are your friend. Stick with four-season perennials. Some have evergreen foliage (ornamental grasses, hellebores, dianthus with its low-creeping foliage) which make them great for winter landscaping. If you aren’t sure, read the plant label prior to purchase to discover if the plant has foliage in the winter so you can see it year-round. 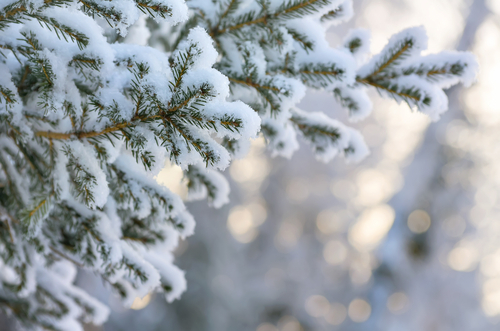 With a little love, you too can make your landscaping a winter wonderland. ‘Tis the season!